Digital Signage Expo (DSE), the tradeshow and conference dedicated to digital signage, interactive technology and digital out-of-home networks (DOOH), today said that early registration discounts for its February 11-13 Annual Educational Conference program will be extended through Friday, January 24th (expiring at midnight). Early booking discounts are significant. For instance, a “Gold Passport,” which provides registrants with the opportunity to attend their choice of four seminars, both Wednesday and Thursday Keynote breakfasts, On-Floor Workshops and the Trade Show Floor, normally costs $1,150.00, but those who book early can save 25% for a cost of only $865.00. While early registration discount extension also applies to all pre-show events, including both half-day and full-day conferences and special association member discounts, discounts are not the whole story. Booking early also guarantees that attendees can see the program or event of their choice. For instance, The Live Installation Tour is now filling seats on the last available coach and 26 of the Industry Roundtable Discussion Groups have sold out with others reaching maximum capacity. For that reason, wait lists are now being established. Registration for the pre- or post-show certifications programs, or any of the educational programs at DSE, which are eligible for certification renewal credits, is available at www.digitalsignageexpo.net. Early registration discounts will now expire at midnight on 1/24/14. An additional 10% registration discount is extended to Digital Signage Federation members. Exhibit Hall passes, which include admittance to the Wednesday evening networking reception, are available at $100 per person. 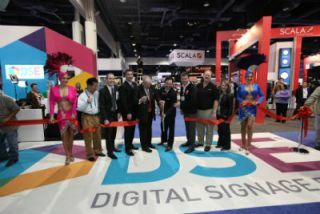 Mark your calendar now: Digital Signage Expo® 2014, co-located with the Digital Content Show, is scheduled for February 11-13, 2014, with access to the Exhibit Hall February 12 & 13 at the Sands Expo & Convention Center in Las Vegas.